Part dimensions are typical from a measured lot. Individual pieces may vary. Due to the material, this product may have minor dimensional variation due to changes in relative humidity. Due to paper's natural structure, the product may be oblong in free state. This will generally aid in the product's retention capability. MOCAP Paper Tapered Plugs are an environmentally friendly and economical masking solution. Made of recyclable paper, these tapered paper plugs do not promote condensation. These closures will withstand up to 400°F (204°C), making them ideal for low-to-high temperature applications. Note: Due to the material, these Tapered Paper Plugs may have minor dimensional variation due to changes in relative humidity. Our MPTP Series Plugs are manufactured in Tan paper and sized to fit 1/8 thru 3 inch Female NPT's. 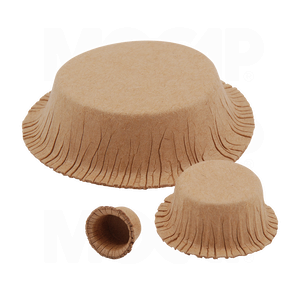 MOCAP stocks Paper Tapered Plugs in many sizes for immediate shipment.